Standalone roulette games tend to be of a very high quality and players don’t need to stray far from our recommended casinos to find an impressive casino experience. Net Entertainment and Electracade in particular have some great versions but this one is by Play N Go. 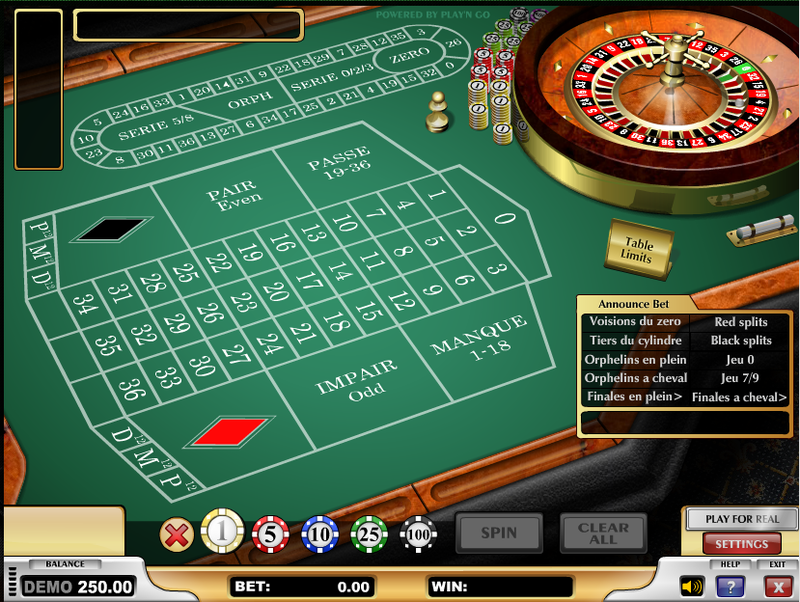 It’s called Roulette La Partage and as you might guess it’s a French version of the game. There is a specific La Partage rule played on some tables which will return half the player’s stake on an even money bet if the ball lands on zero but that doesn’t apply here – it’s just a title. When you first load up the game you’ll see a well laid out design with the table slowly spinning in the top right hand corner and the betting table plus racetrack to it’s left. This is European roulette so there is only now zero, not two as in the American version. Racetrack – this is a quick way to bet on a number and then the numbers surrounding it on the wheel. Just place the chip on the racetrack to view the various options available. Special Bets – these are labelled here as ‘Announce Bet’ in the gold box on the right hand side and here you can find a long list of betting options which once again enable you to select specific groups of numbers. You can also create and save your favourite bets here for easy future use. Read our comprehensive roulette betting guide by clicking here. When all your chips have been placed just click the ‘Spin’ button and away you go. Any wins will paid out when the ball has settled into a slot and you are now ready to start again. Roulette La Partage doesn’t really offer anything extra but it’s of equally good quality to rival offerings and it’s helpful to see the racetrack layout there by default. It’s RTP of 97.30% matches that which you would get at a bricks and mortar casino.